At the beginning of a race, especially a sprint, runners must take their mark. Taking your mark means getting into position and positioning your mind, body and spirit for the task at hand. Getting into position and positioning yourself for the race is as important as the race itself. 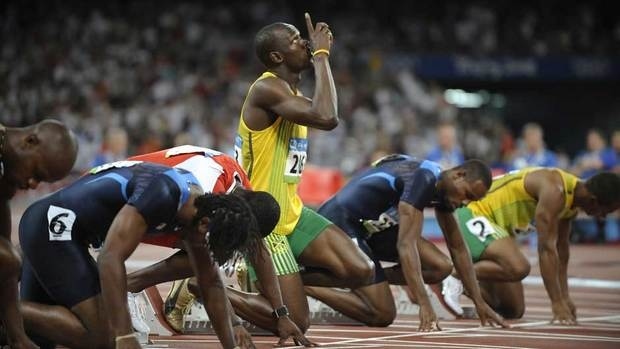 In a sprint, a bad start can be horrendous, and a false start can disastrous, leading to disqualification. And so a good start is not a bad thing. At the beginning of the year we look forward to the promise and the pledge of the coming days and weeks and months. For most of us, a fresh start may be just what the Dr. ordered. January 1st is a good time to take your mark, resume the set position and refocus on the goal. The “Set Position” is the still position runners must assume immediately before the starting device goes off. So now it’s time to take your mark. Get in “the still position” before God and quiet your mind, body and spirit. Listen. Lean into position, and wait for the starting device to sound. The trigger will go off and the trumpet will sound and you will hear and know when it’s time to press off of the starting blocks into the race that is set before you. The command, “runners take your mark, set,” and then the firing of the gun is a three-command start used at track meets. It is similar to “ready, set, go,” and other ignition commands such as “lights, camera, action” and “ready, aim, fire.” Unfortunately, the pilot light has gone out on many of our dreams. There are dreams and desires and destinations we all have that have not been realized or actualized. We started before, but we did not finish. We’ve all said “I’ll get around to it.” Well now it’s time to “Get a Round Tuit.” Stop making excuses, stop giving explanations and start finding a way to get it done. Make every step count. Make every move matter. Don’t waste your time or your talents or your treasures on thoughts and things that could derail you. Lay aside every weight and the sin that could easily beset you and put off all excesses of the flesh and the spirit that could certainly destroy you. At this new beginning, as you sit crouched in the starting blocks of this infant year, prepare to lean and lunge your way forward and then burst into the year as you press toward your God ordained destiny which is found and bound in Christ Jesus. Take your mark, and then press toward the mark for the prize of the high calling of God in Christ Jesus.